Why hike the Snow Creek Trail? This is a classic Yosemite combination of lung-busting hike and iconic views. The switchbacks-to-the-sky ascent from valley to rim climbs 2,600 feet in a punishing 1.7 mile stretch, but there's a memorable view across Tenaya Creek Canyon to Half Dome from the top. If you prefer a gentler hike, there's a longer but less steep route down from Tioga Road that takes five miles to drop 1,700 feet. Scenery Summary: The highlight is the dramatic vista across the canyon to the face of Half Dome, though it's arguably a notch below the similar view from North Dome. If you hike up from Yosemite Valley, you'll pass Mirror Lake early in the hike and then get distant views of little-known Hidden Falls while you're grinding your way up the switchbacks. You'll be enveloped in trees for most of the hike if you start from Tioga Road. There are some pretty cascades in Snow Creek downstream from the Snow Creek bridge, which is a short distance away from the rim. Best Time to Visit: The views should be good any time the Tioga Road is open, but there could be snow on the trail early or late in the season. The cascades below Snow Creek bridge are likely to be prettier early in the year, when there's more Snow Creek on hand. This depends on how wet the previous winter was, though. Crowd Factor: Mixed. Heavy from the Yosemite Valley trailhead to Mirror Lake, generally light elsewhere on the trail, but the area near the rim is a popular camping spot for backpackers. There's also a cabin for winter backpackers hidden in the trees, though it doesn't contribute to crowds during the summer hiking season. 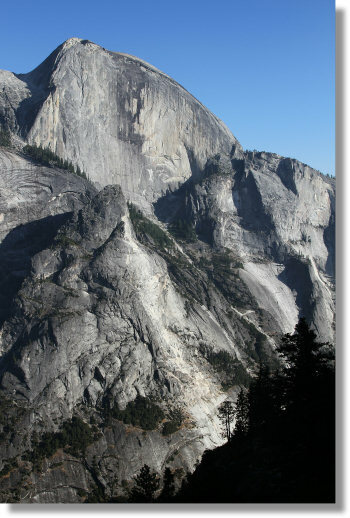 Difficulty: You have two choices on this hike: climb up from Yosemite Valley or amble down from the Tioga Road. The former is one of the park's more sadistic trails, a relentless succession of switchbacks all the way from the valley floor (technically, it's actually the Tenaya Canyon floor) to the rim. It leaves hikers gasping for air and devoting what brain function they have left to murderous thoughts about the trail's designer, who was likely disappointed that so many people have turned out to survive it. Pack spare hearts and lungs. If you've done the Clouds Rest hike, you probably remember the challenging stretch a couple miles along where you climb a thousand feet in a mile. Stack two of those on top of each other, but make it a bit steeper, and you have the Snow Creek Trail. Want more evidence that this is a steep trail? The Upper Yosemite Falls trail goes from the valley floor to the rim in 3.2 miles, the 4-Mile Trail covers it in 4.7 miles, and the Panorama Trail takes 8 miles. The Snow Creek Trail, meanwhile, covers roughly the same amount of vertical in a single 1.7-mile stretch. The hike down from Tioga Road, happily, is a much different affair. It can't be classified as easy, since it's five miles one way and has a few switchbacks of its own, but taking five miles to cover 1,700 feet of vertical results in a much gentler hike overall. You'll have to do nearly all the ascending on the return trip to Tioga Road, though. Parking: For the Tioga Road route, you can park at the trailhead. If you're starting from Yosemite Valley, there's no parking at the trailhead, but the free shuttle buses stop there, so anywhere you can park in the valley - the day-use lots at Yosemite Village and Curry Village are the largest - will work. Nearest Bathrooms: If you're hiking from Yosemite Valley, you'll pass bathrooms along the trail before Mirror Lake. If you're hiking from Tioga Road, the nearest are the pit toilets at the May Lake trailhead, half a mile west on the Tioga Road and then just under two miles north on the May Lake Road. There are bathrooms with plumbing (but no lights - bring a flashlight if you're there after dark) at the Tuolumne Meadows	Visitors' Center, roughly 11 miles east. Nearest Snacks: At the far end of Tuolumne Meadows, 12 miles east. If you're arriving from the west, your last chance to stock up will be at the Crane Flat General Store, 28 miles away at the western endpoint of the Tioga Road. Food-Storage Lockers: None at either Snow Creek trailhead. If you're hiking from Tioga Road, check half a mile to the west at the pullout across the road from the May Lake turnoff. Here's a Google Street View panorama of the pullout. Getting There: The Tioga Road trailhead is 28 miles east of the road's western terminus and around 20 miles west of the park's eastern entrance at Tioga Pass. Here's a Google Street View panorama of the trailhead (note the trail sign just to the right of the road; rotate the view 180 degrees to see the parking area). It's half a mile east of the May Lake turnoff. If you're doing the uphill trek from Yosemite Valley, you'll need to find the Mirror Lake trailhead, which is near the east end of the valley. There's a road past the trailhead, but private cars aren't allowed on it - take one of the free shuttle buses instead. It's stop 17 on this shuttle bus map (PDF). Alternate Route: The easiest route to the Snow Creek vista is probably not to take the Snow Creek trail at all. Instead, start from the North Dome trailhead, then take a left at the trail fork 1.5 miles (2.4 km) along, and you'll meet up with the Snow Creek trail at the Snow Creek footbridge just shy of the valley rim - it's a total of 4.1 miles (6.5 km) one way. Hiking It One Way: If you're allergic to climbing and charming enough to talk someone into dropping you off at the trailhead, your best option will be to hike one way from Tioga Road down to Yosemite Valley, an 8.7 mile trek with 4,500 feet of descent, and, as tends to be the case with one-way hikes, fresh scenery all the way. If you don't have enough cars to pull this off, the Tuolumne Meadows Bus can pick you up in Yosemite Valley and drop you off at the May Lake turnoff, which is half a mile west of the Snow Creek trailhead, for $11.50. Basically, you'd have to hike from this Street View panorama to this one if you can't convince the bus driver to make an unofficial stop at the Snow Creek trailhead. Trail Notes & Hazards: There's no obvious stopping point along the trail where the views will be the best - they'll be notable from about halfway up the rim to the top. Once you've reached the rim, you might want to detour off trail to the granite shelf a short distance to the east, where you'll find open views of the dome. As you approach the edge of this shelf, it begins to slope down towards the abyss and is covered in several places with decomposed granite. Imagine a floor covered with ball bearings, with the added touch that the floor is sloping towards a certain-death fall and the ball bearings have just enough friction to not start sliding over the cliff until you step on them, and you'll have a good idea of the surface here. It's best to stay back from the edge. The trail up from the valley is not only relentlessly steep, but often dotted with rocks as well. Hiking poles can serve as fine impromptu crutches after you've rolled an ankle on one or another of them. The trail from Tioga Road is smoother than the route up the cliff, but sandy for the first mile or so. By high summer it rates a 14 on the inches-of-your-calves-coated-with-dust scale. There are three streams to cross on the trail down from Tioga Road, but you shouldn't have trouble keeping your feet dry unless you're early in the season. If the water is high enough to pose a challenge, you'll usually find that enterprising hikers have preceded you and erected log crossings.